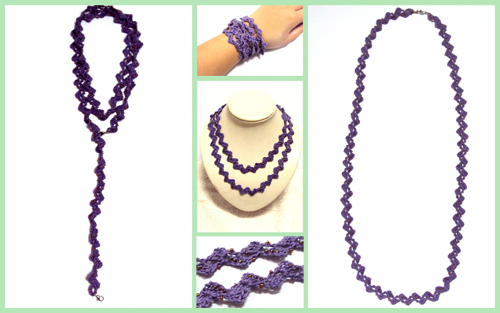 New in the Crochet Spot Store, the Versatile Bijoux pattern is true to its name — there are SO many ways to wear it! Wear it as a long necklace, a lariat, a layered choker, as a bracelet or anklet. You can even use it as a lanyard or eyeglasses strap. Made with ever-abundant crochet thread and seed beads, you can make one to match each outfit in your closet. One size definitely fits all! This entry was posted on Thursday, June 30th, 2011 at 3:51 PM by Claire Ortega-Reyes	and is filed under Best Crochet Patterns. You can follow any responses to this entry through the RSS 2.0 feed. You can leave a response, or trackback from your own site. it’s so pretty, what stitches are used? It’s very pretty! I can’t wait to make it!